Osire Glacier (Ph.D. McGill University, Montréal, 2010) teaches in the History Department, the Religion Department and the Department of Politics and International Studies. She teaches courses in Islam, Women in Islam and Politics and Religion in the Middle East and North Africa. Her research focuses on Moroccan women’s history, politics of gender and sexuality in postcolonial Morocco, and politics of human rights in postcolonial Morocco. She is the author of Sociopolitical Discourse of Femininity, Masculinity and Sexuality in Morocco (Palgrave Macmillan, 2017), Les droits humains au Maroc : entre discours et réalité (Tarik Éditions, 2015), Universal Rights, Systemic Violations and Cultural Relativism in Morocco (Palgrave Macmillan, 2013), and Political Women in Morocco: Then and Now (Africa World Press, 2013), which was published in French as Femmes politiques au Maroc: d’hier à aujourd’hui (Tarik Éditions, 2013). Her blog, http://www.etudesmarocaines.com, aims at disseminating academic knowledge about North African issues within the general public. Daniel Miller is Associate Professor, teaching courses in Hebrew Bible/Old Testament, comparative world religions and Biblical Hebrew. He received his PhD in Near Eastern Studies from the University of Michigan. His research areas are Canaanite-Israelite cultic practices, and ancient West Semitic magic. He is currently working on a book on magic in ancient Israelite society. Michele Murray is Professor in the Religion department. She teaches courses in Christian origins, women in religion, and religion and film. She obtained her M.A. from Hebrew University of Jerusalem in Second Temple period Jewish history, and her Ph.D. in Religion from the University of Toronto. Her research areas are Jewish-Christian relations in the ancient world, and interaction among Eastern Mediterranean religions in late antiquity. Dr. Murray is serving as Dean of Arts and Science for 2014–18. There has been much research directed toward women and magic in the Middle Ages, however studies focusing on women and magic in the first few centuries of the Common Era tend to be rare. Dr. Murray’s research concentrates on the important, yet largely neglected area of women and magic in Jewish and Christian communities of late antiquity. 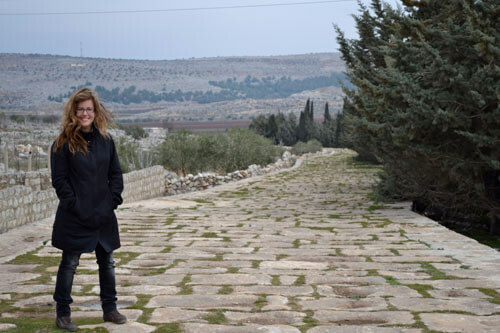 She focuses on the regions of Syria-Palestine and western Asia Minor during the first four centuries of the Common Era, areas that were home to Jewish communities and early Christian churches. Her project will explore literary evidence and archaeological realia (incantations, curse tablets, amulets and inscriptions) pertaining to magical practices in these geographical areas. What did Jewish and Christian writers write and think about women’s relationship to ritual power? What stereotypes of women are reflected in these sources? Were women understood to practice magic differently than men? What types of women are described as engaging in magic? How did some women employ ritual practices to gain power? What types of magical rituals are associated with females? What does material culture, such as curse tablets and amulets, reveal about women’s participation in such rituals? Dr. Murray’s objective is to advance knowledge on the broad topic of religion and magic in late antiquity, and to contribute to the more specific area of women’s religious and ritual practices in early Christianity and post-biblical Judaism. Dr. Murray and Mohammad Dashan (a Bedouin), Dr. Murray’s current research project brings together her interest in investigating literary evidence and archaeological realia for insight into ancient religious practice. Scholarly attention has been drawn of late to the importance of studying adaptive religious structures in the Roman world, particularly evidence reflecting architectural modification of the private home for cultic use. Analysis of the various stages of renovation of ancient buildings imparts important social evidence regarding the status and circumstances of religious communities. Dr. Murray’s goal is to explore the religious activities of ancient Nabatean people; more specifically, she wishes to examine whether a large Nabatean housing complex, recently unearthed at Wadi Ath-Thamad, Jordan, reflects evidence of architectural renovation for cultic purposes. In the first century CE, the Nabateans, a Semitic tribespeople, controlled more than 1000 sites throughout the Mediterranean, particularly dominating the trade routes of the Arabian Peninsula. They were a wealthy people who secured the sources and markets or the profitable frankincense and myrrh trade and added to this spices, gems, balsams, bitumen, and, eventually, even the China silk trade. Petra, located in modern-day Jordan, was their urban capital. This strikingly beautiful city contained an oversized theatre, public bath, temples, and more than 800 rock-carved funerary monuments. This project entails both textual analysis and the study of archaeological data. For the textual analysis, Dr. Murray will investigate Roman, Jewish, and Christian sources from the Late Antiquity for information regarding Nabatean religious practices. The archaeological component of the project requires that Dr. Murray gather all available excavation reports on Nabatean communities and, centrally to the project, participate in the Canadian-led archaeological excavation at Wadi Ath-Thamad, Jordan. 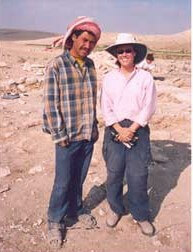 Photo: Dr. Murray and Mohammad Dashan (a Bedouin), participating to the archaeological dig at Wadi Ath-Thamad, Jordan, summer 2004. Playing a Jewish Game: Gentile Christian Judaizers in the First and Second Centuries C.E. (Waterloo: Wilfrid Laurier University Press, 2004). “The First Letter of John” in The Jewish Annotated New Testament, 2nd Edition, eds. Amy-Jill Levine and Marc Zvi Brettler (Oxford: Oxford University Press, 2017), 518-526. “Romans 2 Within the Broader Context of Gentile Judaizing in Early Christianity,” in The So-Called Jew in Paul’s Letter to the Romans, eds., Rafael Rodriguez and Matthew Thiessen (Minneapolis: Fortress Press, 2016), 163-182. “Jewish Traditions” in World Religions, eds., Willard Oxtoby, Amir Hussain and Roy C. Amore (Oxford: Oxford University Press, 2014), pp. 74-147 to “Jewish Traditions” in World Religions, eds., Willard Oxtoby, Amir Hussain and Roy C. Amore (Oxford: Oxford University Press, 2014), pp. 74-147. “The First Letter of John” in The Jewish Annotated New Testament, eds. Amy-Jill Levine and Marc Zvi Brettler (Oxford: Oxford University Press, 2011), 448-455. “Religion and the Nomadic Lifestyle: The Nabateans” in Travel and Religion in Antiquity, ed., Philip A. Harland (Waterloo: Wilfrid Laurier University Press, 2011): pp. 215-234. “Female Corporeality, Magic, and Gender in the Babylonian Talmud,” Religion & Theology 15, no 3&4 (2008): pp.199-224. “The Magical Female in Greco-Roman Rabbinic Literature” Religion and Theology 14, no. 3&4 (2007), pp. 284-309. “Christian Identity in the Apostolic Constitutions: Some Observations” in Identity & Interaction in the Ancient Mediterranean: Jews, Christians and Others, eds. Zeba Crook and Philip Harland (Sheffield Phoenix Press, 2007), pp. 179-194.